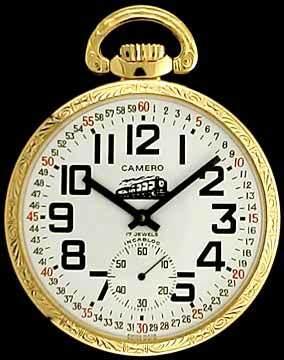 This Swiss made Style Railroad Watch, uses the ETA 6497-1 movement. On the back side of the case is a etched design of a Steam Engine. Outside case measures 49.25 mm in diameter. Dial measures 43.20 mm in diameter. This would be a great movement for someone just starting to learn about watches to practice with.